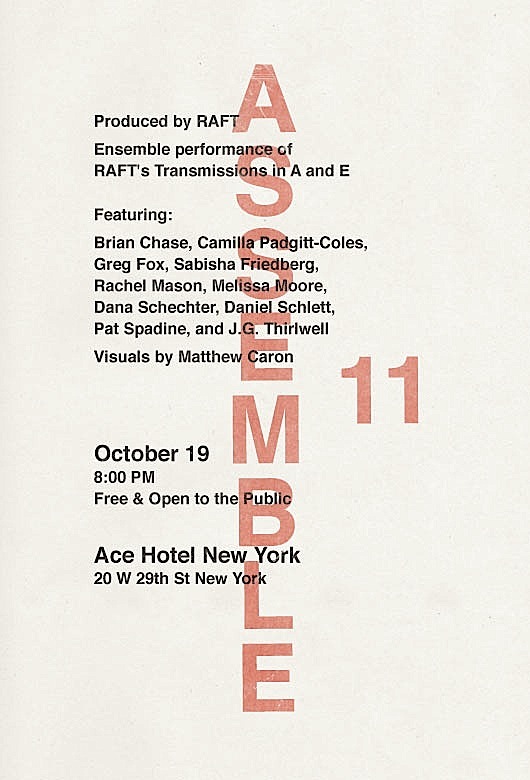 JG Thirlwell will be participating in a Performance of RAFT’s Transmissions in A and E on October 19 at the Ace Hotel in NYC. RAFT is the project of Pat Noecker (These Are Powers, Liars, No Things). RAFT gathers performers from NYC underground + experimental music scenes, scatters them around a room, and sets them loose — creating a personalized, fully immersive music experience that alters depending where you’re standing. 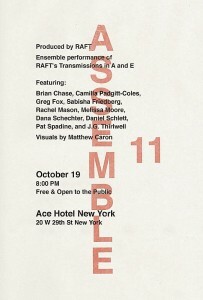 The performance, in it’s simplest form is 11 musicians working to sustain the notes of A and E.
For this performance RAFT will be joined by Camilla Padgitt-Coles, Dana Schechter, Melissa Moore, Rachel Mason, Sabisha Friedberg, Brian Chase, Daniel Schlett, Greg Fox, Pat Spadine and JG Thirlwell.